Abstract: What role do politicians have in bargaining with violent non-state actors to determine the level of violence in their districts? Although some studies address this question in the context of civil war, it is unclear whether their findings generalize to organizations that do not want to overthrow the state. Unlike political actors, criminal groups monopolize markets by using violence to eliminate rival firms from the marketplace. We argue that increased tenure in political office increases cartels’ knowledge about local political elites’ willingness to accept bribes. With bribes accepted and levels of police enforcement low, cartels endogenously ratchet up levels of violence because its marginal value is greater under these conditions. 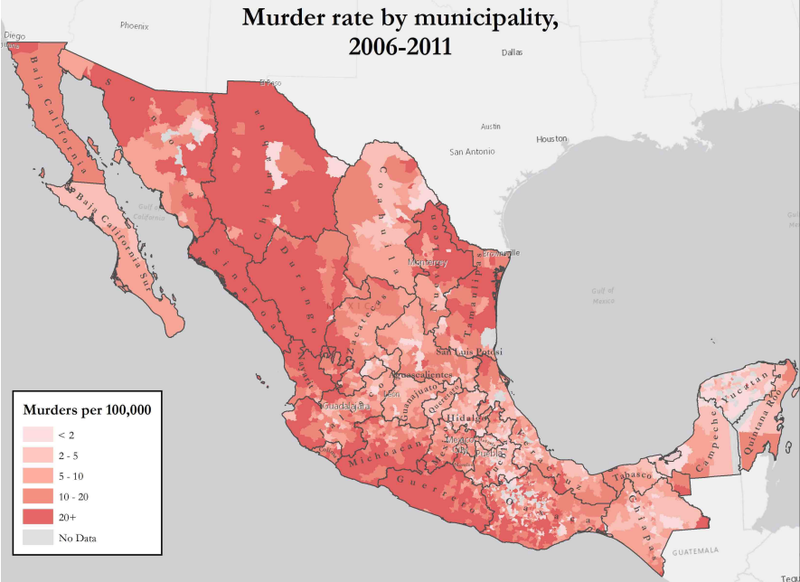 We formalize our claims with a model and then test its implications with a novel dataset on violent incidents and political tenure in Mexico. For one additional year of political tenure, the sum of this effect across all municipalities is an additional 2,300 homicides per year. Published in the British Journal of Political Science.